This scrapbook is a compilation of valuable historical ephemera of the Rhode Island State Normal School now known as Rhode Island College. The scrapbook has been divided into nine parts for ease of downloading for the researcher. 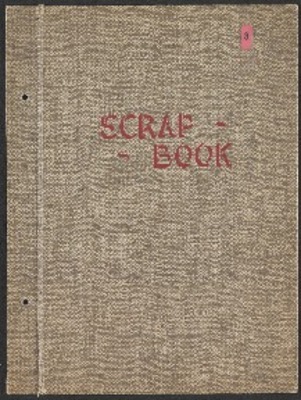 The scrapbook spans the years from 1874 to 1941 with a wealth of primary sources. Part 1, the Rules and Regulations, contains 15 pages with newspaper clippings along with photographs of the school’s first building and those who were instrumental in the beginning of the school. Part 2, Thomas Bicknell, 1890, includes 19 pages with newspaper clippings from the Providence Journal and a booklet written by Thomas Bicknell with the history of Normal Schools and its dire need in the state of Rhode Island. Part 3, Report, contains 14 pages of the report submitted to the General Assembly for the “Commission to Select and Purchase a site and erect thereon a Building for the State Normal School” in the year 1899. Also included in this part are newspaper clippings, a ribbon from the reception committee in 1894, and a photograph. Part 4, Industrial History, contains 13 pages of a booklet on a course lecture on history, a booklet on the evolution of Rhode Island’s Normal School. The latter booklet contains photographs within it of the exterior building, classrooms, and a class in session. Part 5, Extension Courses, contains 3 pages of what a day of typical course schedules. Part 6, Letter to Sarah Marble, contains 47 pages beginning with a photograph of Ms. Marble and includes a program for the Presentation of School Music, a list of graduates receiving diplomas, and various letters to Ms. Marble on topics such as achievements of the school, and meeting cancellations. There are also newspaper clippings and sketches of the State Normal School and the commissioner of education, dedication announcements, graduation exercises, reunion announcements and programs. Part 7, Class Prophecy, contains 12 pages including the class prophecy written by Miss Lucy Booth, and newspaper clippings of the school. Part 8, Examination, contains 6 pages of a commencement program and newspaper clippings. Part 9, Dedication, contains 41 pages of the dedication of the school in 1879 including the program for the ceremony, address of the commissioner of public schools and other addresses made, and includes a list of examiners and teachers of the State Normal School.